Over-the-top togs, elegant attire, and eekful props are on display, in Beverly Hills. Whenever we're scared while watching something hair-raising at home, as in, spill-the-bag-of-chips-everywhere frightened, as in, peer-behind-the-couch creeped-out, we can take solace in the fact that there is a screen separating us from the dastardly doings going on inside the scary story world. Go ahead and tap your TV. Tap tap tap. Well, wait, maybe don't do that, because you'll just leave fingerprints. You get the idea. But here's another idea: A costume and prop show can serve as a goosebumpily "between" spot for the fan of horror television. It removes the screen, and while we're not exactly inside the terrifying tale, we're feet away from items used in the tale that made us look behind our couch. "American Horror Story" has been inspiring couch-look-behinders since 2011, with a potent, scream-packing series of different worlds that consistently build upon a beyond-cult fan base of fervent proportions. So much of that potency has been conveyed through the sublime sartorial look of the FX hit, and the masterful and macabre prop creation, too. 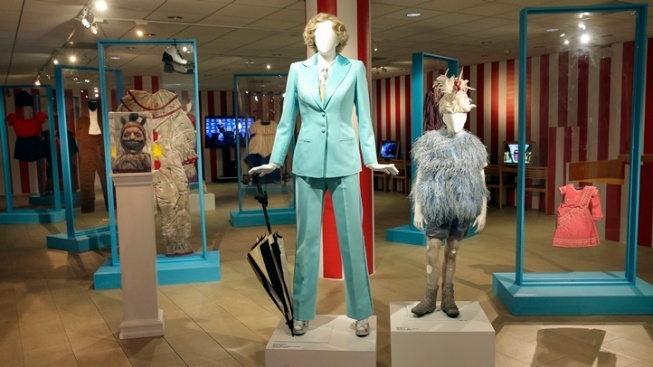 In honor of both, The Paley Center for Media in Beverly Hills is hosting an exhibit called "American Horror Story: The Style of Scare." It's on through July 30, 2017, which, as Angelenos know, is basically the cusp of Halloween season in LA. And a not-frightful thing about the exhibit? It's free to see. Also not-frightful, unless you show up on a Monday or Tuesday? The exhibit is open Wednesdays through Sundays. "Murder House," "Hotel," "Roanoke," and all of the distinct and deviously plotted incarnations of AHS will be on flagrant, mischievous display through a host of memorabilia, frocks, and eerie items that will be recognizable to passionate viewers of the wickedly watchable phenomenon. Will a certain clown make a cameo? And a Hotel Cortez sign? And some magnificent hats straight of "Coven"? And will the talents of creator Ryan Murphy and costume designer Lou Eyrich be very much on display? It's not autumn yet, but if you're ready for the jumps, or at least a nifty, in-depth peek at how the highly ornamental, elegant, and eek-filled costumes and props associated with the series look in person, set out for The Paley Center by the light of day.